On October 8th, Professor Anna McCarthy interviewed Norman Lear — producer, social activist, philanthropist, and recipient of the National Medal of Arts — at the Rauschenberg Foundation as part of their We the People exhibit. I recently interviewed Lear at the Robert Rauschenberg Foundation‘s new project space, and Maude, one of the sitcoms he co-produced in the 1970s, was among the topics we discussed. The show made history in 1972 with a storyline in which the title character, played by Bea Arthur, decided to have an abortion. The episode, like Lear himself, is very funny. And like its creator, it is simultaneously very serious. Although much of his career is defined by television comedy, Norman Lear does not come off as a jokester. He is a careful listener, and when he speaks he uses precise gestures that complement his complete-sentence style of talking. He always wears his lucky hat, a white canvas pork pie model. This eccentric touch signals, I think, his openness to nonconformity, to magical thinking, and to people who live below the celebrity line. The majority of us, in other words. These qualities, and the chutzpah it takes to wear the same hat all the time, should be considered essential survival tools for progressives in today’s political culture, recent election results notwithstanding. 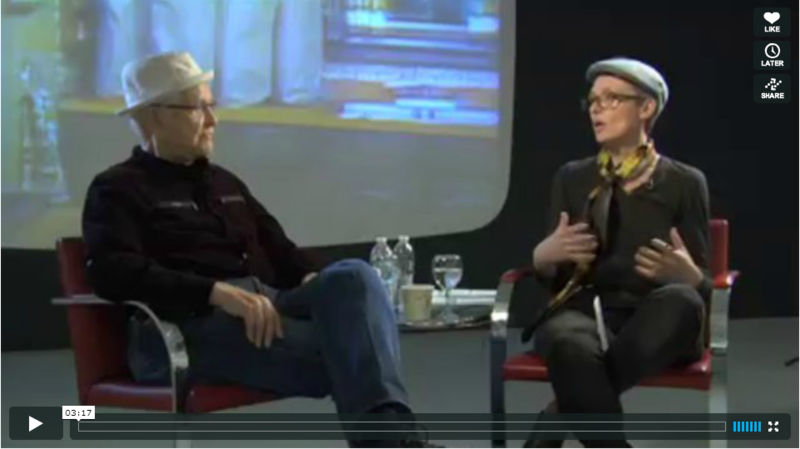 You can see video of McCarthy’s interview with Norman Lear at the Rauschenberg Foundation Project Space website.